Currently Watching – Aug2010 Edition | personal.amy-wong.com - A Blog by Amy Wong. – Gloria – for Doona Bae… and ok, Chunderella xD Thanks for the heads up, Julz. There seems to be a lot going on. Doona Bae (pictured with the mic) plays a woman with an attitude problem, she either ends up raising her voice to people or hitting them. Her sister has some sort of development problem… so she acts always like a child. Plus, her bro (Chunderella, aka Chunhee Lee pictured with the white shirt) is an ex-mafia guy with little intelligence. There’s also a girl who is very suicidal, and will probably have some sort of relationship with Chunhee’s character. The other dude seems like a rich kid who struggles for being the “other woman’s” kid. 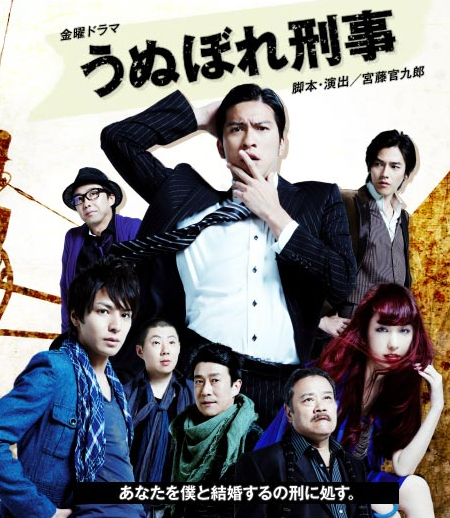 – Atami no Sousakan – for Satoshi Miki’s work, plus Joe Odagiri, Chiaki Kuriyama, Eri Fuse and the whole cast, which also includes Ayako Fujitani. Satoshi Miki’s humor is… well, you gotta adapt, but once you do it’s so so phunny. Many people are comparing the show to Twin Peaks with Satoshi Miki’s humor. Eri Fuse kills me every scene she’s in… and it’s only been 2 episodes. A school bus carrying a group of girls from a private school disappears without explanation. One of the girls appears unconscious, and wakes up years later… a group of detectives — similar to the FBI — arrive to re-start the investigation. – Nihonjin Shiranai no Nihongo – The Japanese Japanese people don’t know. Because I like programming where I learn stuff… and this is actually kind of entertaining helpful. I haven’t seen the live adaptation of The Girl Who Leaps Through Time — haven’t seen the animated film either — so I’ve only seen Naka Riisa on HALFWAY, which I didn’t really like. But here, she actually reminds me a lot of Asami Mizukawa, and I’m a big fan of Mizukawa. Who kills me the most? Natsuki Harada playing Katori, often mistaken for Catherine. xD KA~TORIN janai. Katori desu. Riisa plays Haruko, a young woman who wants to become a high school teacher, but ends up being a teacher at a Japanese for Foreigners school. The episodes center – only seen 4 eps atm – on each of the students, and how Haruko helps them helping her. You see, Haruko has promised all of her class will graduate or she’ll quit her dream of being a high school teacher. – Unubore Deka – Conceited detective. Because it has Yu-chan and written by Kankuro Kudo, as well as with some of the same people who worked on Tiger & Dragon, which was a really REALLY great show. Recommended as a first show. A detective, dumped by his now ex-girlfriend, is looking for someone to marry with. But the women he falls for at first sight/touch/etc seem to always be guilty of a crime he’s investigating. A certain someone killed some very bad lady, but no one seems surprised. xD Everyone saw it coming, except for Nancy. Of course, it had to be Nancy. Yu-chan in on Tiger & Dragon, which is about Rokugo. I also find it easier when foreigners speak Japanese xD I think it's a given in any language… except when Asians speak English. That's the hardest for me. Bae Doona can play a deadpan actress, and she would excel. And ditto on Naka Riisa, have you see Asami Mizukawa's Yume wo Kanaeru ZOU? Riisa reminds me so much of that. Haven't seen Yume wo Kanaeru ZOU yet, but I found the raws on Lets-Look, so I will start download it next. the show was harsubbed, if I remember correctly.